Preface: All capitalist systems have some inequality. We don’t want to prevent all inequality … just economy-wrecking levels:that is a myth. A who’s-who’s of prominent economists in government and academia have all said that runaway inequality can causefinancial crises. Extreme inequality helped cause the Great Depression, the current financial crisis … and the fall of the Roman Empire. But inequality in America today is actually twice as bad as in ancient Rome , worse than it was in in Tsarist Russia,Gilded Age America, modern Egypt, Tunisia or Yemen, many banana republics in Latin America, and worse than experienced by slaves in 1774 colonial America. It is worse under Obama than under Bush. A recent study shows that the richest Americans captured more than 100% of all recent income gains. And see this. There are 2 economies: one for the rich, and the other for everyone else. They are fundamentally two separate types of economies. Why is Inequality Going Through the Roof? The world’s top economic leaders have said for years that inequality is spiraling out of control and needs to be reduced. Why is inequality soaring even though world economic leaders have talked for years about the urgent need to reduce it? Because they’re saying one thing but doing something very different. And both mainstream Democrats and mainstream Republicans are using smoke and mirrors to hide what’s really going on. securing government tolerance of monopoly power (The richest person in the world in 2011, Carlos Slim, controlled Mexico’s newly privatized telecommunication industry). One big part of the reason we have so much inequality is that the top 1 percent want it that way. The most obvious example involves tax policy …. Monopolies and near monopolies have always been a source of economic power—from John D. Rockefeller at the beginning of the last century to Bill Gates at the end. Lax enforcement of anti-trust laws, especially during Republican administrations, has been a godsend to the top 1 percent. Much of today’s inequality is due to manipulation of the financial system, enabled by changes in the rules that have been bought and paid for by the financial industry itself—one of its best investments ever. The government lent money to financial institutions at close to 0 percent interest and provided generous bailouts on favorable terms when all else failed. Regulators turned a blind eye to a lack of transparency and to conflicts of interest. Wealth begets power, which begets more wealth …. Virtually all U.S. senators, and most of the representatives in the House, are members of the top 1 percent when they arrive, are kept in office by money from the top 1 percent, and know that if they serve the top 1 percent well they will be rewarded by the top 1 percent when they leave office. By and large, the key executive-branch policymakers on trade and economic policy also come from the top 1 percent. When pharmaceutical companies receive a trillion-dollar gift—through legislation prohibiting the government, the largest buyer of drugs, from bargaining over price—it should not come as cause for wonder. It should not make jaws drop that a tax bill cannot emerge from Congress unless big tax cuts are put in place for the wealthy. Given the power of the top 1 percent, this is the way you would expect the system to work. The financial industry spends hundreds of millions of dollars every election cycle on campaign donations and lobbying, much of which is aimed at maintaining the subsidy [to the banks by the public]. The result is a bloated financial sector and recurring credit gluts. Indeed, the big banks literally own the Federal Reserve. And they own Washington D.C. politicians, lock stock and barrel. See this, this, this and this. Two leading IMF officials, the former Vice President of the Dallas Federal Reserve, and the the head of the Federal Reserve Bank of Kansas City, Moody’s chief economist and many others have all said that the United States is controlled by an “oligarchy” or “oligopoly”, and the big banks and giant financial institutions are key players in that oligarchy. Thieves … took over the whole economy and the political system lock, stock, and barrel. No wonder the government has saved the big banks at taxpayer expense, chosen the banks over the little guy, andsaid no to helping Main Street … while continuing to throw trillions at the giant banks. 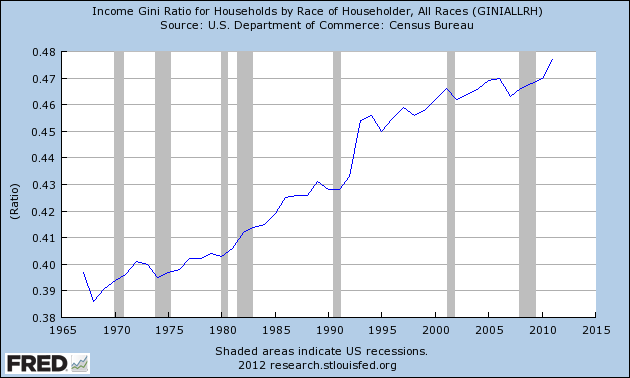 No wonder crony capitalism has gotten even worse under Obama. No wonder Obama is prosecuting fewer financial crimes than Bush, or his father or Ronald Reagan. All of the monetary and economic policy of the last 3 years has helped the wealthiest and penalized everyone else. See this, this and this. Stiglitz said in 2009 that Geithner’s toxic asset plan “amounts to robbery of the American people”. And economist Dean Baker said in 2009 that the true purpose of the bank rescue plans is “a massive redistribution of wealth to the bank shareholders and their top executives”. Quantitative easing doesn’t help Main Street or the average American. It only helps big banks, giant corporations, and big investors. And by causing food and gas prices skyrocket, it takes a bigger bite out of the little guy’s paycheck, and thus makes the poor even poorer. The game of capitalism only continues as long as everyone has some money to play with. If the government and corporations take everyone’s money, the game ends.The fed and Treasury are not giving more chips to those who need them: the American consumer. Instead, they are giving chips to the 800-pound gorillas at the poker table, such as Wall Street investment banks. Indeed, a good chunk of the money used by surviving mammoth players to buy the failing behemoths actually comes from the Fed. Without the government’s creation of the too big to fail banks (they’ve gotten much bigger under Obama), the Fed’s intervention in interest rates and the markets (most of the quantitative easing has occurred under Obama), andgovernment-created moral hazard emboldening casino-style speculation (there’s now more moral hazard than ever before) … things wouldn’t have gotten nearly as bad. Moreover, the Fed has more or less admitted that it is putting almost all of its efforts into boosting the stock market. Some cheerleaders say rising stock prices make consumers feel wealthier and therefore readier to spend. But to the extent most Americans have any assets at all their net worth is mostly in their homes, and those homes are still worth less than they were in 2007. The “wealth effect” is relevant mainly to the richest 10 percent of Americans, most of whose net worth is in stocks and bonds. The recovery has been the weakest and most lopsided of any since the 1930s.After previous recessions, people in all income groups tended to benefit. This time, ordinary Americans are struggling with job insecurity, too much debt and pay raises that haven’t kept up with prices at the grocery store and gas station. The economy’s meager gains are going mostly to the wealthiest. Stock market gains go disproportionately to the wealthiest 10 percent of Americans, who own more than 80 percent of outstanding stock, according to an analysis by Edward Wolff, an economist at Bard College. The top 10% have 80% to 90% of stocks, bonds, trust funds, and business equity, and over 75% of non-home real estate. Since financial wealth is what counts as far as the control of income-producing assets, we can say that just 10% of the people own the United States of America. In today’s edition of Bloomberg Brief, the firm’s economist Richard Yamarone looks at one of the more unpleasant consequences of Federal monetary policy: the increasing schism in wealth distribution between the wealthiest percentile and everyone else. … “To the extent that Federal Reserve policy is driving equity prices higher, it is also likely widening the gap between the haves and the have-nots….The disparity between the net worth of those on the top rung of the income ladder and those on lower rungs has been growing. According to the latest data from the Federal Reserve’s Survey of Consumer Finances, the total wealth of the top 10 percent income bracket is larger in 2009 than it was in 1995.Those further down have on average barely made any gains. It is likely that data for 2010 and 2011 will reveal an even higher percentage going to the top earners, given recent increases in stocks.” Alas, t his is nothing new, and merely confirms speculation that the Fed is arguably the most efficient wealth redistibution, or rather focusing, mechanism available to the status quo. This is best summarized in the chart below comparing net worth by income distribution for various percentiles among the population, based on the Fed’s own data. In short: the richest 20% have gotten richer in the past 14 years, entirely at the expense of everyone else. In contrast, retail giant Wal-Mart talks of its “busiest hours” coming at midnight when food stamps are activated and consumers proceed through the check-outs lines with baby formula, diapers, and other groceries. Wal-Mart has posted a decline in same-store sales for eight consecutive quarters. Indeed, as CNN Money pointed out in 2011, “Wal-Mart’s core shoppers are running out of money much faster than a year ago …” This trend has only gotten worse: The wealthy are doing great … but common folks can no longer afford to shop even at Wal-Mart, Sears, JC Penney or other low-price stores. [Economics professor] Jamie Galbraith argues that countries with larger financial sectors have greater inequality, and the link is not an accident. (Economist Steve Keen has also shown that “a sustainable level of bank profits appears to be about 1% of GDP”, and that higher bank profits leads to a ponzi economy and a depression). A major source if inequality is unemployment, underemployment and low wages. Government policy has created these conditions. And the pretend populist Obama – who talks non-stop about the importance of job-creation – actually doesn’t mind such conditions at all. The“jobless recovery” that the Bush and Obama governments have engineered is a redistribution of wealth from the little guy to the big boys. Economists at Northeastern University have found that the current economic recovery in the United States has been unusually skewed in favor of corporate profits and against increased wages for workers. In their newly released study, the Northeastern economists found that since the recovery began in June 2009 following a deep 18-month recession, “corporate profits captured 88 percent of the growth in real national income while aggregate wages and salaries accounted for only slightly more than 1 percent” of that growth. The study, “The ‘Jobless and Wageless Recovery’ From the Great Recession of 2007-2009,” said it was “unprecedented” for American workers to receive such a tiny share of national income growth during a recovery. The share of income growth going to employee compensation was far lower than in the four other economic recoveries that have occurred over the last three decades, the study found. Obama apologists say Obama has created jobs. But the number of people who have given up and dropped out of the labor force has skyrocketed under Obama (and see this). And the jobs that have been created have been low-wage jobs. The median pay for top executives at 200 big companies last year was $10.8 million. That works out to a 23 percent gain from 2009. Most ordinary Americans aren’t getting raises anywhere close to those of these chief executives. Many aren’t getting raises at all — or even regular paychecks. Unemployment is still stuck at more than 9 percent. “What is of more concern to shareholders is that it looks like C.E.O. pay is recovering faster than company fortunes,” says Paul Hodgson, chief communications officer for GovernanceMetrics International, a ratings and research firm. According to a report released by GovernanceMetrics in June, the good times for chief executives just keep getting better. Many executives received stock options that were granted in 2008 and 2009, when the stock market was sinking. Now that the market has recovered from its lows of the financial crisis, many executives are sitting on windfall profits, at least on paper. In addition, cash bonuses for the highest-paid C.E.O.’s are at three times prerecession levels, the report said. The average American worker was taking home $752 a week in late 2010, up a mere 0.5 percent from a year earlier. After inflation, workers were actually making less. Unemployment has never been so high — 9.1 percent — this long after any recession since World War II. At the same point after the previous three recessions, unemployment averaged just 6.8 percent. – The average worker’s hourly wages, after accounting for inflation, were 1.6 percent lower in May than a year earlier. Rising gasoline and food prices have devoured any pay raises for most Americans. – The jobs that are being created pay less than the ones that vanished in the recession. Higher-paying jobs in the private sector, the ones that pay roughly $19 to $31 an hour, made up 40 percent of the jobs lost from January 2008 to February 2010 but only 27 percent of the jobs created since then. Corporate profits are up. Stock prices are up. So why isn’t anyone hiring? Actually, many American companies are — just maybe not in your town. They’re hiring overseas, where sales are surging and the pipeline of orders is fat. The trend helps explain why unemployment remains high in the United States, edging up to 9.8% last month, even though companies are performing well: All but 4% of the top 500 U.S. corporations reported profits this year, and the stock market is close to its highest point since the 2008 financial meltdown. But the jobs are going elsewhere. The Economic Policy Institute, a Washington think tank, says American companies have created 1.4 million jobs overseas this year, compared with less than 1 million in the U.S. The additional 1.4 million jobs would have lowered the U.S. unemployment rate to 8.9%, says Robert Scott, the institute’s senior international economist. “There’s a huge difference between what is good for American companies versus what is good for the American economy,” says Scott. Many of the products being made overseas aren’t coming back to the United States. Demand has grown dramatically this year in emerging markets like India, China and Brazil. Government policy has accelerated the growing inequality. It has encouraged American companies to move their facilities, resources and paychecks abroad. And some of the biggest companies in America have a negative tax rate … that is, not only do they pay no taxes, but they actually get tax refunds. And a large percentage of the bailouts went to foreign banks (and see this). And so did a huge portion of the money from quantitative easing. More here and here. 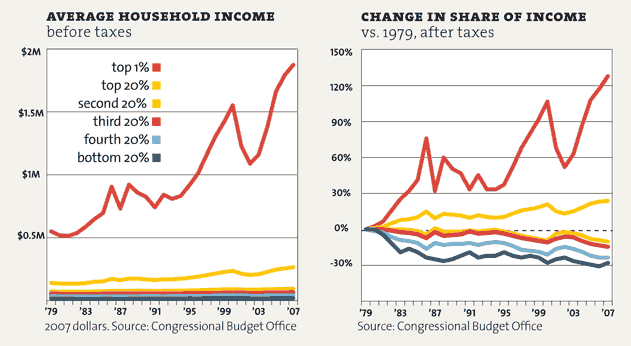 The largest contributor to increasing income inequality…was changes in income from capital gains and dividends. Drastic income inequality growth in the United States is largely derived from changes in the way the U.S. government taxes income from capital gains and dividends, according to a new study by Thomas Hungerford of the non-partisan Congressional Research Service. The study … conclusively found that the wealthy benefitted from low tax rates on investment income, which in turn caused their wealth to grow faster. Essentially, taxing capital gains as ordinary income would make the playing field more fair, and reduce over time income inequality. Lowering tax rates on capital gains, which is how the rich receive a large portion of their income, has given the wealthiest Americans close to a free ride. Indeed, the Tax Policy center reports that the top 1% took home 71% of all capital gains in 2012. Ronald Reagan’s budget director, assistant secretary of treasury, and domestic policy director all say that the Bush tax cuts were a huge mistake. See this and this.